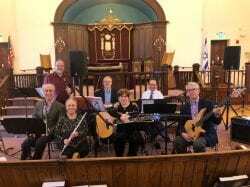 Concert at Ahavas Achim in Newburyport - Greater Newburyport Community Media Hub, Inc.
Newburyport’s Congregation Ahavas Achim will host Bashert (Yiddish for “meant to be” or “destined to be together”) on Friday, February 8, 2019, at 6 p.m. Bashert is an ensemble of seven vocalists and instrumentalists from Congregation Beth Israel of the Merrimack Valley in Andover, Mass. The band strives to engage the Jewish community through musical Friday night services, drawing on a variety of sources for melodies for Kabbalat Shabbat (welcoming the Jewish Sabbath). Each selection in the Kabbalat Shabbat service is arranged by the group, with sounds that range from soulful and contemplative to joyous and uplifting. Most of all, Bashert strives to render the melodies in ways that are appealing to and able to be sung by all, and enthusiastically encourages congregational participation throughout the service. The service will be followed by a Mexican-themed dinner buffet. The cost for the meal is $18 for adults and $12 for children ages 11 and under, or $60 for a family of 4 or more. The service is open to all, but advance registration and payment for the meal at www.caa-newburyport.org/event/Bashertdinner is required to ensure that adequate food is prepared. Bashert’s members are Mike Roesler (clarinet), Merle Roesler (guitar, vocals), Jon Brody (percussion), Elaine Winic (flute, vocals), Bob Moverman (keyboard, guitar), Jeremy Finkle (vocals), and Philip Onigman (bass). Founded in 1896, CAA is an inclusive and egalitarian unaffiliated Jewish congregation serving Newburyport and neighboring communities in MA and NH. Led by Rabbi Benjamin Resnick, CAA offers a range of programming for all ages, including a thriving Hebrew School. Left to right: Mike Roesler (clarinet), Jeremy Finkle (vocals), Elaine Winic (flute, vocals), Jon Brody (percussion), Merle Roesler (guitar, vocals), Bob Moverman (keyboard, guitar), Philip Onigman (bass).